It's been an especially trying last few days with my son, but tonight he did something cute and smart with books that made me forget my frustrations, well for a minute anyway. He started pulling books off of his shelf while he was searching for the perfect story, a practice where he has become an expert, in an effort to stay up just a few minutes longer. Tonight he made a long train of books on the floor and just as I was about to ask him to put them back on the shelf, I noticed something about them. There was a mixture of board, paperback and hardback books, but they all had a common theme. I said, "Why did you put these here?" He replied, "Cause they're all construction books." What's really interesting about this is that I was just talking with some other educators last week about using book sorting in the classroom as an activity for talking about genres and fiction versus non-fiction. These teachers were talking about using book sorting with upper grades, but I think this could be a valuable activity for a variety of levels. 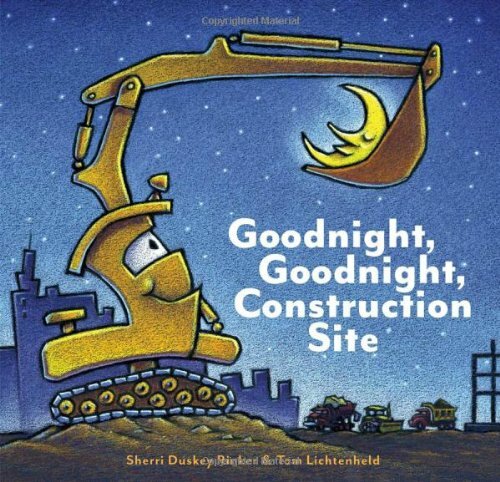 Ultimately tonight, my son chose one of his favorites, Goodnight, Goodnight Construction Site written by Sherri Duskey Rinker and illustrated by Tom Lichtenheld. This one is great for truck lovers like my son as the construction trucks finish up their work and head off to bed. It's a fantastic, easy to read rhyming book with excellent illustrations. It contains construction vocabulary that only those who know about trucks can truly appreciate. It's the perfect bedtime book for rough and tumble boys because even those big, tough trucks get sleepy.